Safeguarding procedures in school are overseen by a member of the Senior Leadership Team (currently Mrs Hollebon), with a lead Governor (currently Mrs Burleigh) responsible for ensuring that these procedures are in place and are monitored regularly. 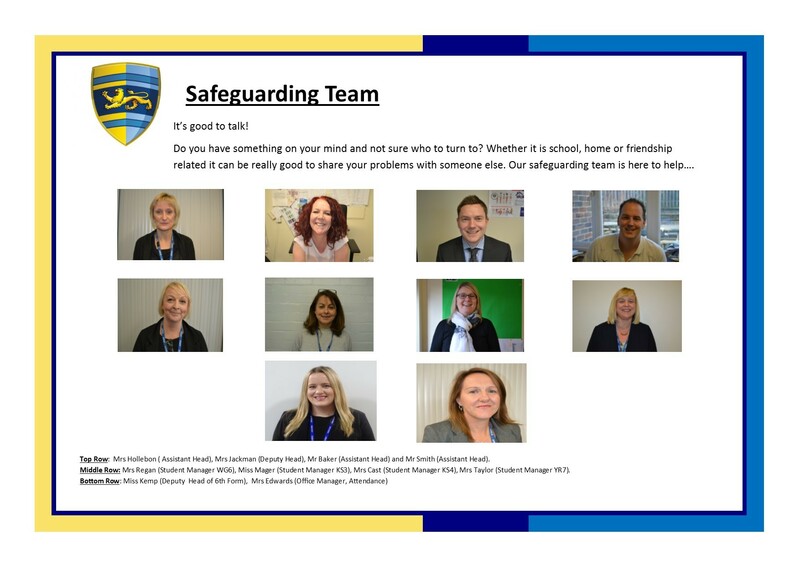 The school has a designated DSL (Designated Safeguarding Lead currently Mrs Hollebon) and a Safeguarding Team who meet regularly to discuss any ongoing safeguarding or welfare concerns, offering support and guidance where necessary. The school’s Child Protection and Safeguarding Policy can be viewed under the policies section of the school website. All staff, including non-teaching staff have received recognised training in safeguarding and child protection. Any visitors to the school are required to report to the office to obtain a named visitor’s badge and are given a summary sheet about safeguarding within the school. All students understand the importance of safeguarding issues and have been introduced to the members of the safeguarding team in assemblies. They to are aware of how to report safeguarding or welfare concerns about themselves or others. All students are aware of the importance of e-safety and have received guidance from the IT department and through assemblies on safe use of the Internet. A revised anti-bullying policy has been developed by the student respect and equality committee in conjunction with a group of students across all key stages.